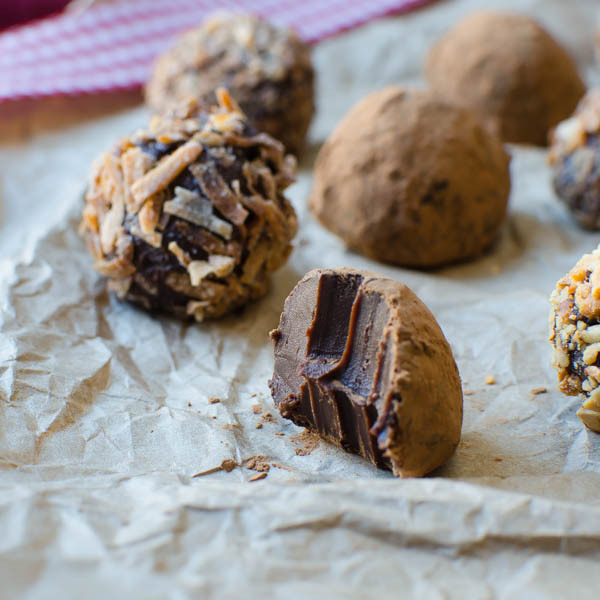 The idea of “making chocolates” might seem daunting — except when it comes to truffles. Even an amateur can make a good truffle. 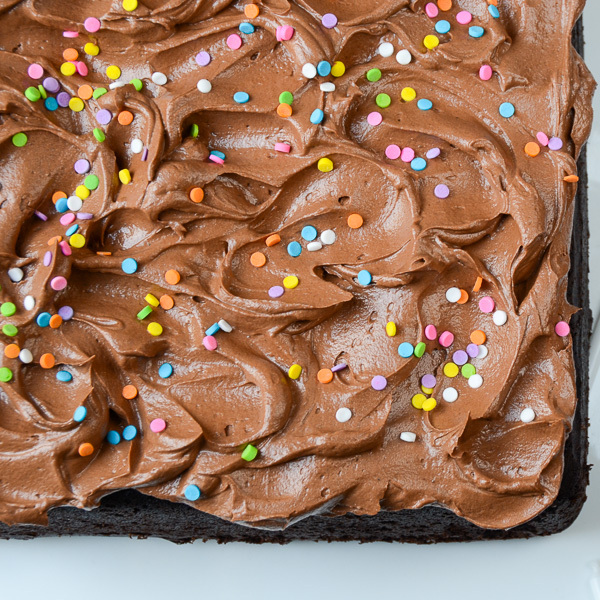 It takes little more than good chocolate, cream and your imagination. Today, I’m making Truffles Two Ways. 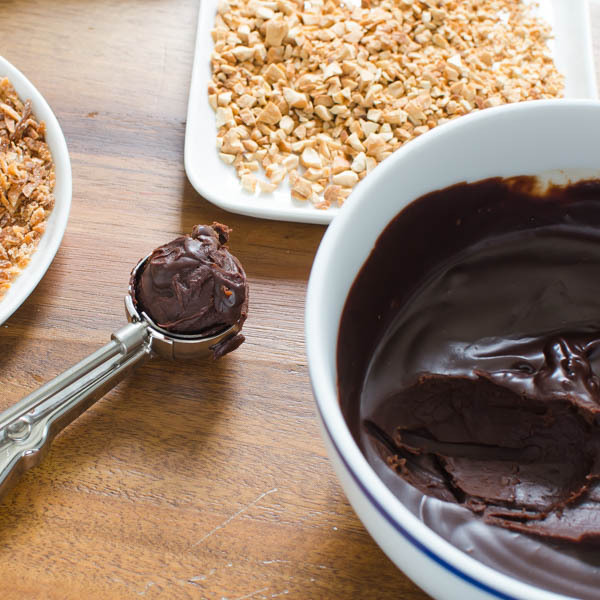 Start with quality bars like Ghirardelli, Scharffenberger or Lindt and chop them finely. Transfer to a glass bowl set over a pot of simmering (not boiling) water — and make sure the water doesn’t touch the bottom of the bowl. Stir the chocolate and cream together until it’s melted and free of any lumps. 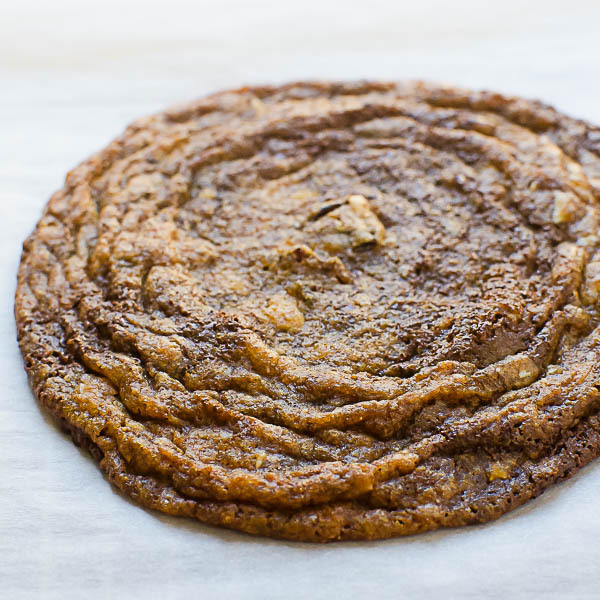 This recipe came from my friend, Nola and it calls for 6 ounces of chocolate per batch, however, chocolate bars are sold in 4-ounce increments… Sure, I could buy two bars, use one and a half and save the remaining half for something else. Nah. I did the logical thing. I bought three bars and made a double-batch. (Smirk). 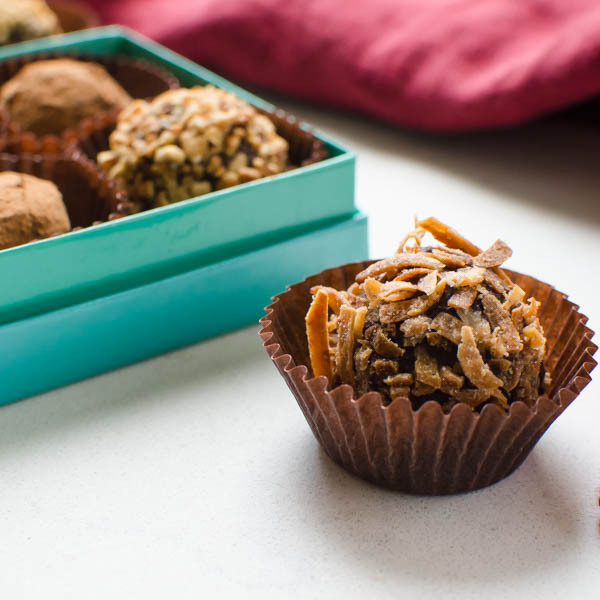 Plain chocolate truffles are positively decadent — and there’s really no need to embellish them, but we have an affinity for chocolates infused with flavors. And since I had enough chocolate for two batches, I decided to make two polar opposite flavored truffles. One with curry powder and rolled in toasted coconut and/or cashews, and the other infused with black currant liquor (Cassis) and rolled in cocoa powder. The cassis truffles have a nice berry finish to them that’s balanced and not overpowering. 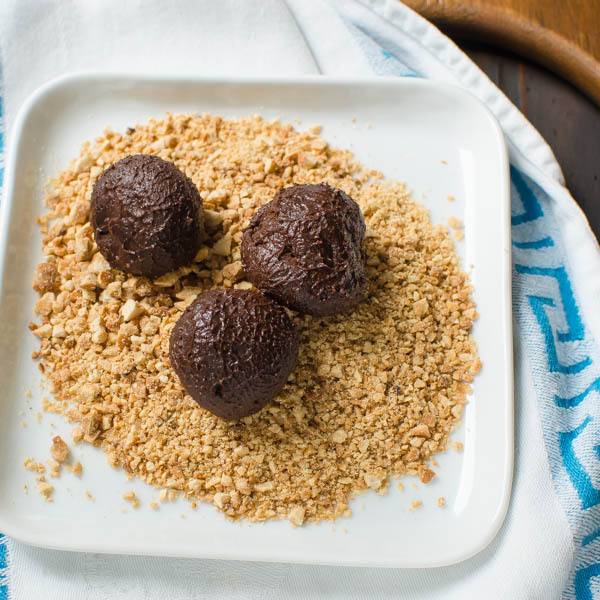 The curried truffles are meltingly sweet with a complex spice and finished with a roll in roasted cashews or toasted coconut for a little texture. Since it’s the holidays and you’re probably going to scads of parties, make a batch or two of truffles and give them as a hostess gift. You’ll be guaranteed an invitation to next year’s bash, too. Chocolate truffles are very customizable. In these two renditions, one is spiced with chile powder (recipe via my buddy Nola - who loves a tingle on her tongue) the second is curry and coconut. Decidedly grown-up candy and its fabulous! Chop chocolate into small pieces. Fill the bottom of a double boiler or small saucepan with one cup of water. Over medium heat, bring water to a simmer and reduce heat to medium low. In the top of double boiler add chocolate and cream. 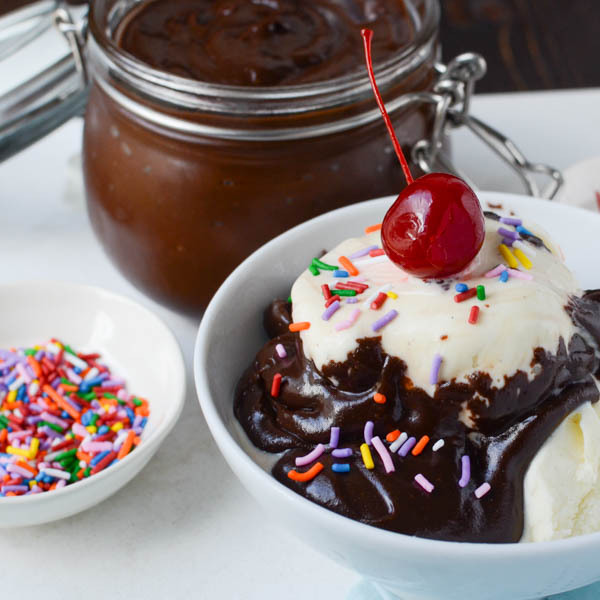 Stir just until chocolate melts and blends with the cream into a smooth uniform ganache. 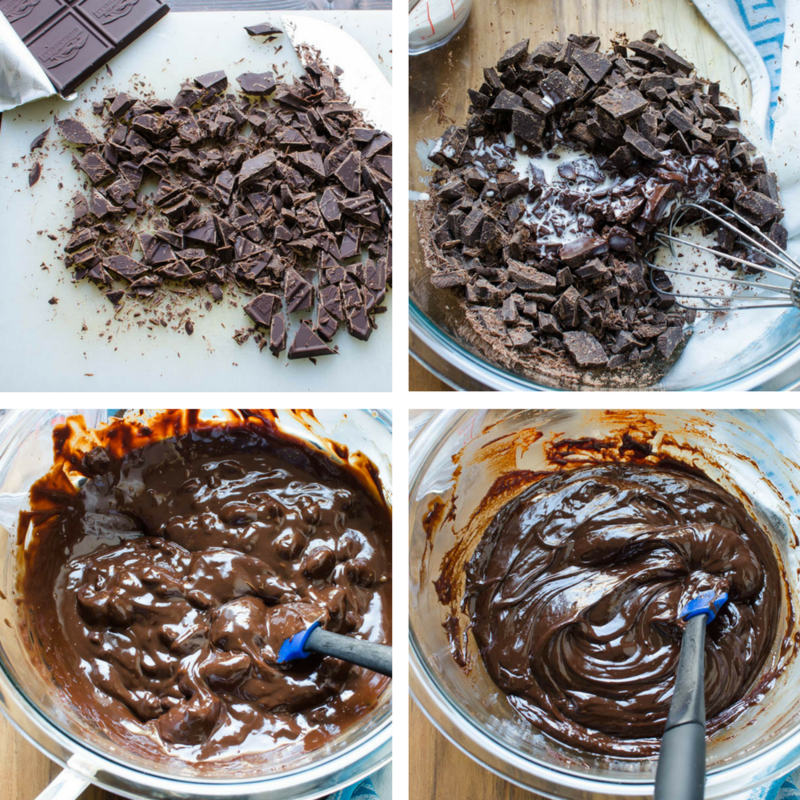 Transfer half of the chocolate to another bowl. To one bowl of chocolate, add the creme de cassis. Stir to combine. Cover and chill until firm enough to shape (1 1/2 to 2 hours). 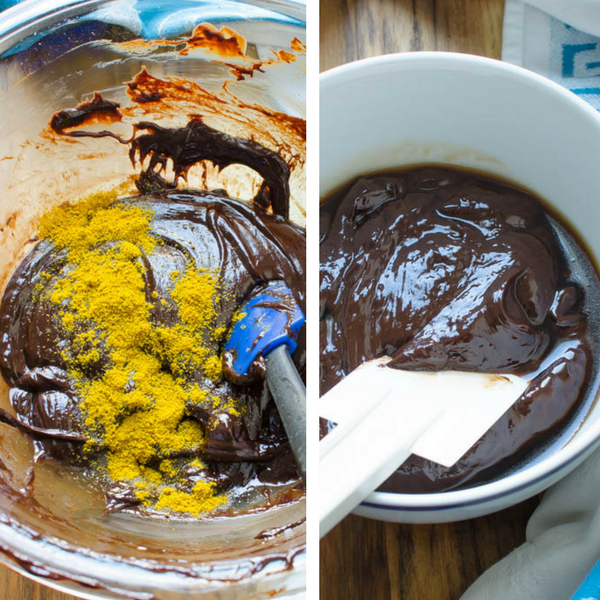 Add curry powder to the second bowl of ganache. Stir to combine. Cover and chill until firm enough to shape (1 1/2 to 2 hours). 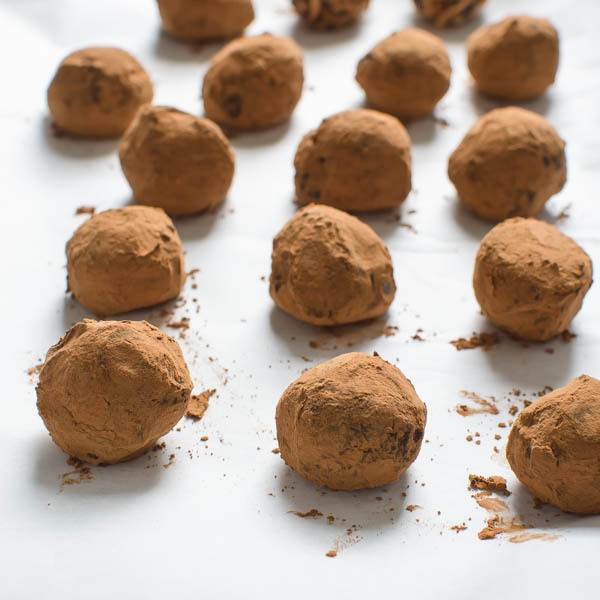 Scoop out rounded teaspoonfuls of the chocolate mixture and quickly press and roll them into rough 1-inch balls. Roll the cassis truffles in the cocoa powder to coat. 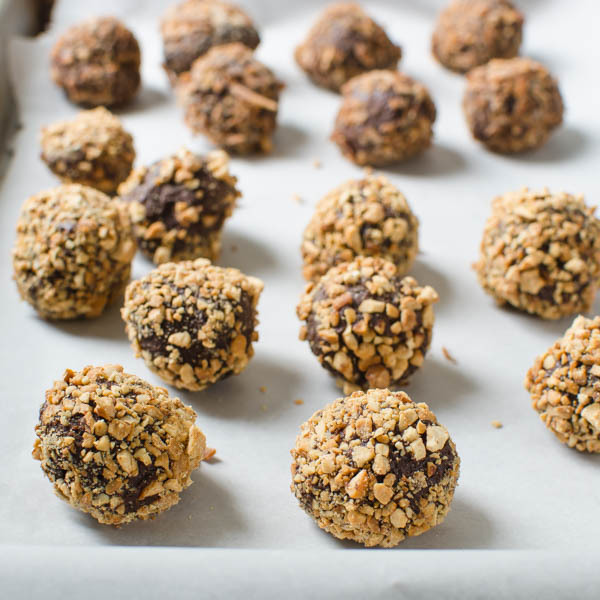 Roll the curry truffles in either the coconut or cashews to coat. Place balls on a small baking sheet and chill until firm. Store truffles in an airtight container in the refrigerator for up to a week. Serve truffles at room temperature for the best flavor. 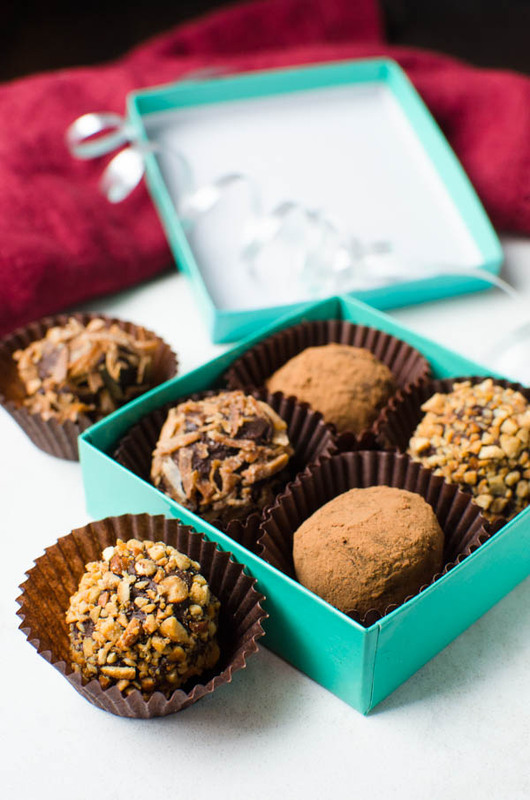 These chocolaty homemade truffles are best for the gift. Just love this. Thanks, Alena! I agree, homemade truffles are wonderful as gifts. These truffles sound amazing Lisa! I’ve never attempted to make truffles but you make it sound easy. I love your logic behind making a double batch..Yes!! Ohhh, you had me at chocolate. These look delicious! Cashews and coconuts, I love both of those! 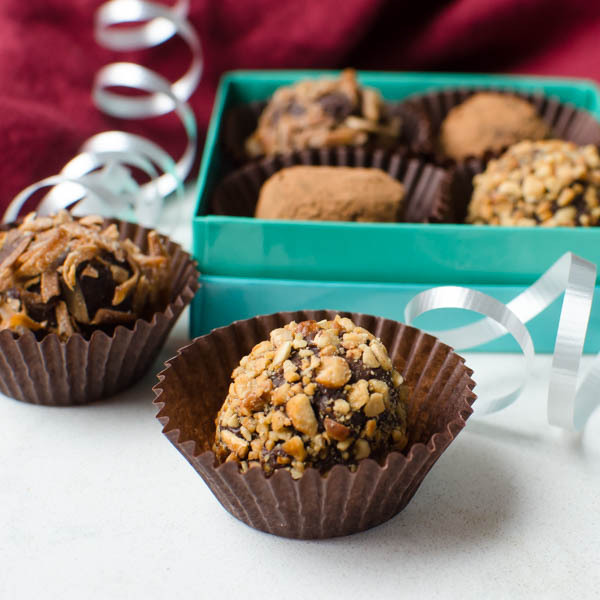 Homemade truffles are perfect as gifts, too! I just have one thing to say ~ I hope I’m on your gift list!! Wow, these truffles look beautiful, Lisa! I’m loving the unexpected flavor combos, I bet they’re delish. 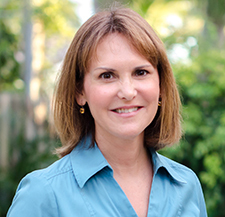 Thanks, Britt! Both are terrific combos and I vacillate on my favorite, depending on my mood.